weini Mobile Game Controller is designed to improve your game experiences. Do you feel that you can't enjoy the game well when playing the PUBG shooting games? Are you still troubled by being busy with a series of complex operations? Don’t worry. Our upgraded game controller will help you solve the problems and bring you a better and more exciting game experience! 1. Supported devices: iPhoneX/8/7/7plus/6s/6splus/6/6plus/5s/5c/5, SamsungS9/S8/S8+/Note8, Nexus5X/6P, LGG5G6V20, Lumia950, Lumia950XL, Huawei P10/P9/P9Plus, OnePlus 2/3, Nokia N1, HTC 10 andmore. 2. Highly sensitive,the high sensitivity helps you make quick response and win the game easily. 3. 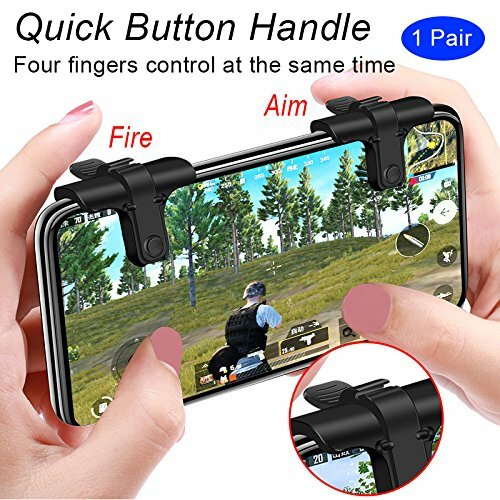 Very stable, the clip design makes the mobile game controller not easy to move. 4. Small and lightweight, you can bring it wherever you go and use it whenever you want to play games. 5. High quality material, highly durable buttons are stable to connect the phone and very hard to damage. 6. The shooting controllers are easy to operate with pretty sensitive touch buttons and high precision. 1. Start your game, and press the "Settings"-"Control"-"Customize"
4. Adjust the shoot and aim buttons under the touchpads of the cell phone game controller.